There’s nothing like the rush of getting stories published. I have lots of magazine publications and now several educational publications. Every time I hear that a magazine or publisher wants to use my writing, I celebrate. 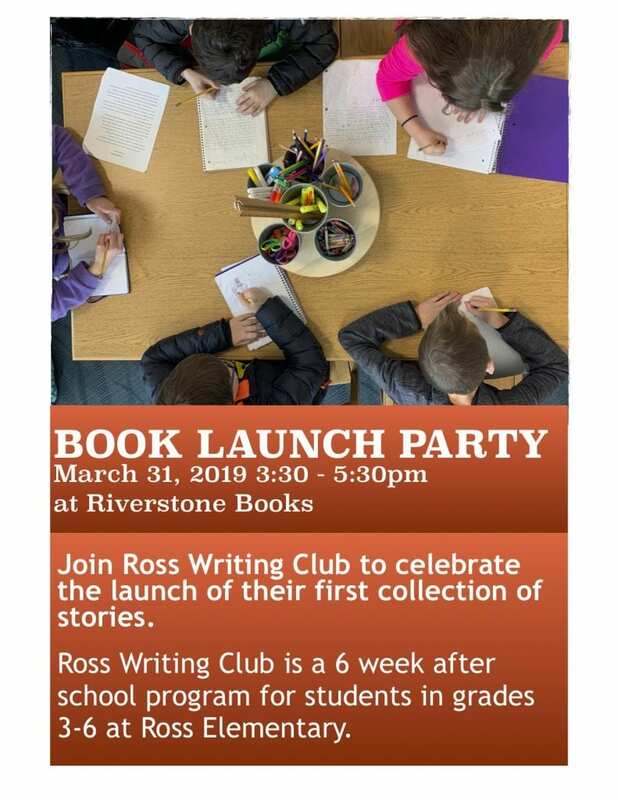 I was able to share that feeling with the kids in Ross Writing Club. We just finished the first ever Ross Writing Club at our elementary school. We met after school on Mondays for an hour for six weeks. Kids wrote all kinds of stories. We talked about plot, character, endings and word choice. They revised their own stories. They critiqued each other’s writing. Then we published a collection of their stories. 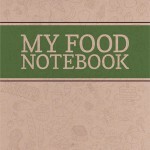 We had 31 writers and this book is 64 pages long! We had a book launch to celebrate their hard work and creativity. At the book launch, some of the writers sat at a table and were interviewed about their work. It was so memorable and fulfilling for me. I truly hope the kids felt the same. I’m especially proud of these two writers. 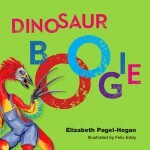 The book is also available in the local authors section of our library! I know the kids were especially excited about that. I knew just how they felt. 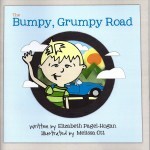 Writers of any age love getting stories published. But it’s never easy. 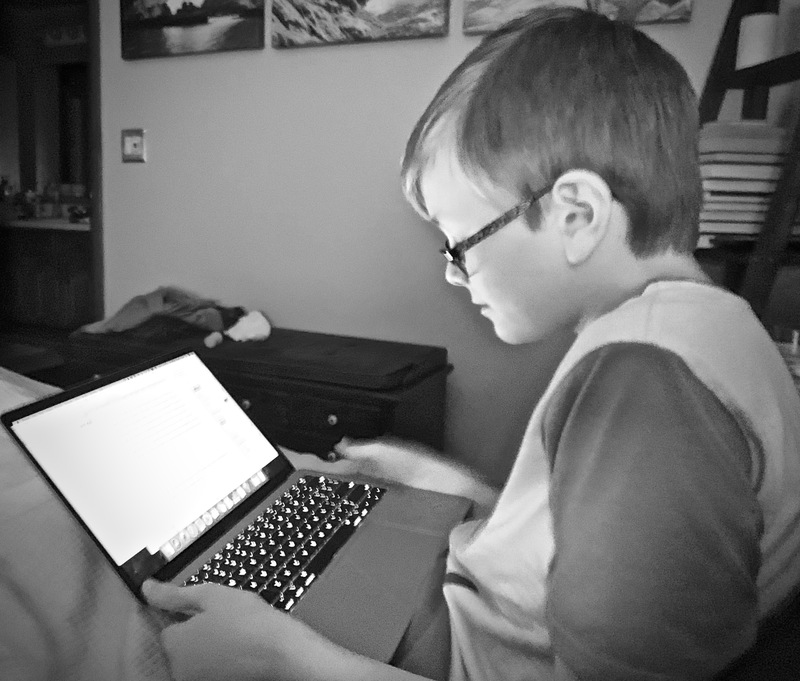 In addition to writing club, I’m also a writing coach for a young man. His goal is to be a horror writer. That’s not easy for a young person. One of his first obstacles, like a writer of any age, was finishing his stories. He worked on that. Now he has several completed stories. The next step is getting published stories. He wants to submit them to magazines or journals. But it’s tough finding the right fit for your work. One of his first choices is closed right now. His second choice doesn’t accept work that includes cannibals. Since his story includes cannibalism, we crossed that off his list. I finally found a publisher for a story I wrote back in 2013. It only took six years. I’m persistent. It’s not easy finding a place to publish your work. What are your strategies for finding the right publication? I will write anywhere. You never know when inspiration will strike.I usually carry a little notebook with me and I always have my phone and my laptop. I used to have a small bluetooth keyboard by Zagg that made it easy for me to type on my phone fast. It was wonderful for when I was somewhere with small surfaces. I could also type without pulling out my giant laptop, so it didn’t attract as much attention. It died, so I got a new one. 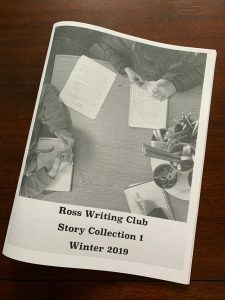 My middle and my youngest are in writing club this winter and they want to work on their stories at random times. My middle likes to type right before bed. The youngest recently worked on his story using my mini-keyboard while we were waiting for our food at Chili’s. When you’re a writer, you write anywhere, any way you can. 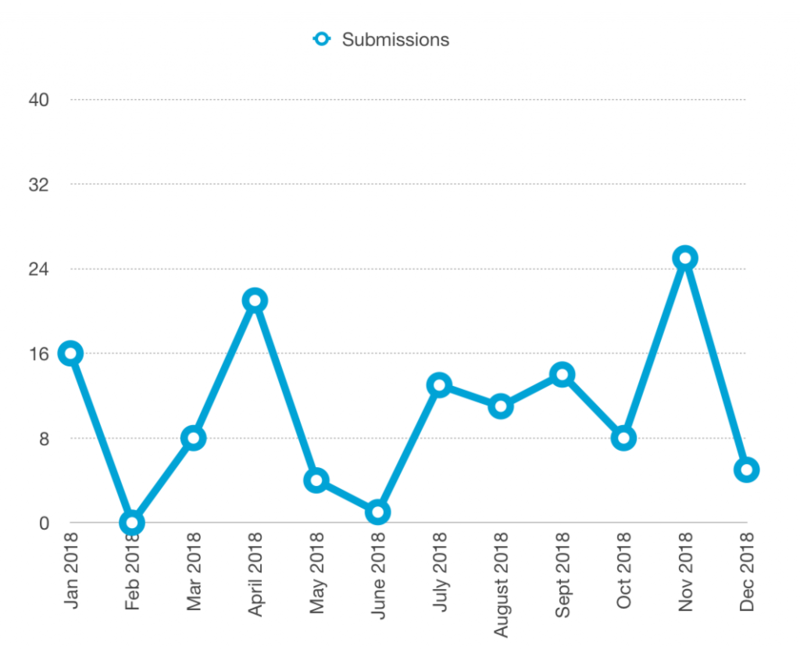 I like to keep track of my writing rejections and acceptances by year. Sometimes when I’m feeling frustrated, just knowing I have submitted ideas, stories, and projects gives me a boost. I use Numbers to track my submissions, but I also use an old-fashioned paper notebook. The paper notebook might be my good luck charm, like an athlete who won’t change socks after a winning game. My submissions are usually a mix of old ideas and new ones. I like to have a big fat pipeline of stories in production and swirling around in the publishing universe. I really believe you can’t sell if you’re not submitting. Let’s take a look at my submissions for 2018. A grand total of 126 submissions is pretty good! I had the chance to work on a project for teachers that totaled 11 different submissions, so that boosted the number. Also, I pitched a bunch of greeting card ideas this year, I think about a dozen. But I only counted each email as one pitch. So the number could go even higher. If you add the rejections and acceptances, you might notice it doesn’t equal 126. That’s because most of the time, I just don’t hear back from places. 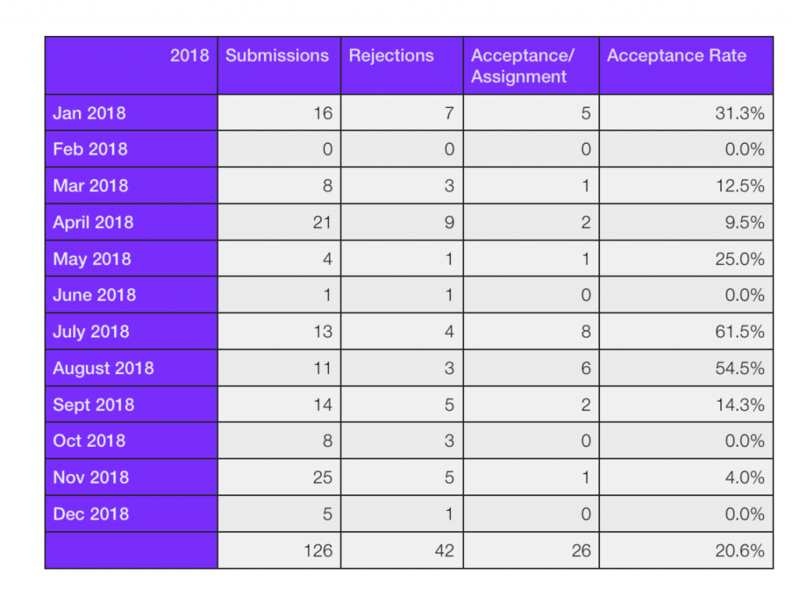 I could assume those are rejections, but one time I received an acceptance over a year after I had submitted something! So I usually just leave it blank until I hear back. In total last year, I had a 20% acceptance rate. That feels very good. I feel very confident when I send some stories out to my favorite magazines. But I also signed a deal for my first non-fiction book that will come out in fall 2019. That felt amazing. Here’s how my work looked month to month. My busiest month in 2018 was November, and I didn’t submit anything in February or June. I’d like to change that this year and try to submit something every month, even if it’s only one thing. So far, so good on that goal in 2019. I already have 21 submissions. I’m bummed to report I also already have six rejections. But that also means I have six stories that could work somewhere else! Revise! Repurpose! Resubmit! Do you keep track of your submissions? Rejections? Acceptances? You can see my other yearly recap here. I’m taking a children’s illustration class and it’s scary. It’s class hosted by our local arts center, the North Hills Center for the Arts. Our instructor is Jeanine Murch and she does some lovely work! I’m especially excited to learn about lettering from her. The other people in the class aren’t scary. In fact, my friends Beth and Jessica are in the class. What’s scary is that I don’t have any confidence in myself as an illustrator. I love to doodle and draw and feel I’ve painted and sketched a few nice things lately. But I haven’t achieved something that feels like an illustration to me. I want to create something COOL. 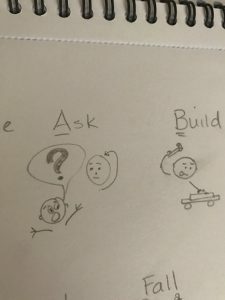 Our homework for next week is to bring in a two page spread that illustrates either a story from a list Jeanine provided, or illustrates something of our own. I have an idea of a story of my own that I might tackle, but I have a sneaking suspicion that it looks better in my mind than it will on the page. A lot the art I create feels very static, like a photograph capturing an image. But for illustration, I want there to be action and emotion. I want an illustration that tells a story. I’m pretty confident about my writing. When I go into workshops, I feel connected with words and my ability to craft a sentence that evokes emotions and tells a story. But can I do this with art? I’m just not sure. It’s ok to be scared, though. Taking this class will be good for me, because if you don’t ask questions, you can’t learn new things. I’m glad that in addition to this class, I’m also doing #kidlitart28 because having the daily task to create some art is keeping me honest. In addition to me learning about illustration for myself, I do hope that this class will help me as RA for our SCBWI region. I want to do my best to support all of our members, not just writers. It’s scary trying something new like this, but I’m going through with it because I know it won’t hurt me. I know I will learn a ton. I may even find that I can create something I’m proud of in the end! I like trying new things, they give me a creative boost. I think it’s essential to get out of my comfort zone so I can think about the world differently, learn about new perspectives, and be more creative in general. One small way I learn about new things is to visit new places. Sometimes I travel big, like going to new countries. 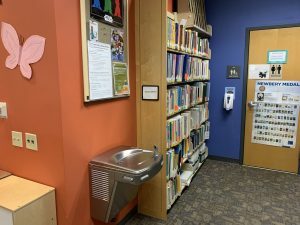 Sometimes it’s small, like going to a new library in my larger community. 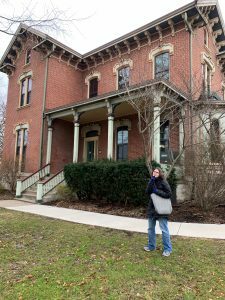 That’s why in January I grabbed some writing friends and visited a new-to-me but old library, the Andrew Bayne Memorial Library in Bellevue, PA for a creative boost. 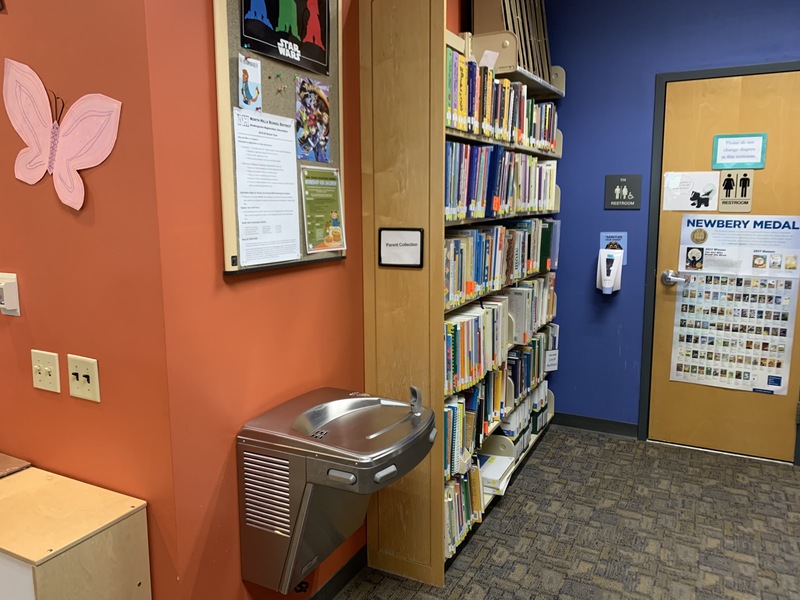 It’s technically called the Andrew Bayne Memorial library, and is named after a sheriff of Allegheny County, Andrew Bayne. His daughters donated the building. I read an article online that it was haunted, and I wanted to give it a visit. I’m not really a ghost story lover, and I do but don’t believe in ghosts. I’ve done some reading about the ghosts at Jean Bonnet tavern on the turnpike, and started – but couldn’t finish – the ghost tour at the Omni Bedford Springs. But I wanted to check this place out. One of my friends apparently worked as a ghost hunter for a short time and was convincingly skeptical, so I wasn’t really nervous while I was there. It really felt like a library in someone’s house. It reminded me so much of the house we lived in while we were in Brighton Heights. The tall ceilings, the wonky-aligned doors. 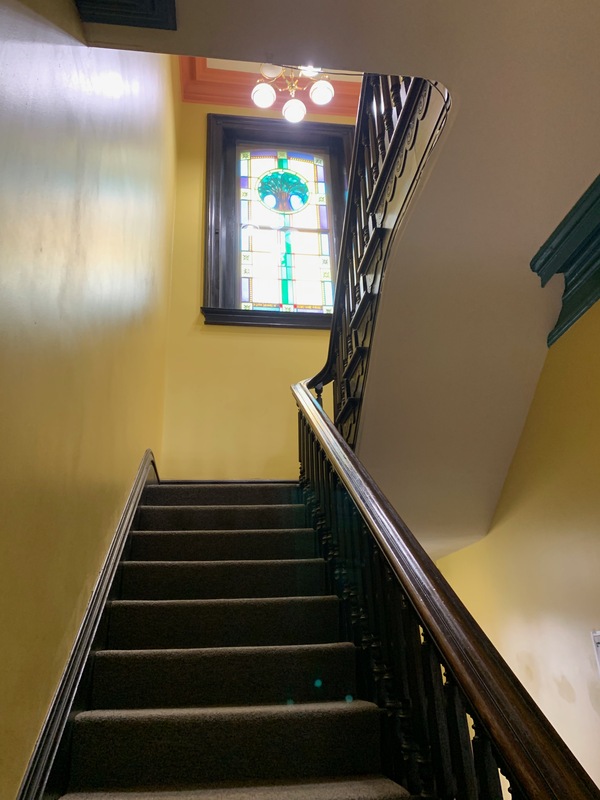 The gorgeous stairs and stained glass windows. It really is beautiful. The librarian greeted us the moment we stepped in, and that made it beautiful, too. I had a wonderful time visiting the building but I’ll be honest, I didn’t get much writing done. My friends and I spent a lot of time chatting, but to be fair, we chatted about writing. I did not see the ghost of Amanda Bayne Balph, who is supposedly haunting the building since a massive elm tree nicknamed “The Lone Sentinel” was taken down in 1998. Perhaps all of the talking scared her off. I did discover this poster listing 100 words every ninth grader should know. 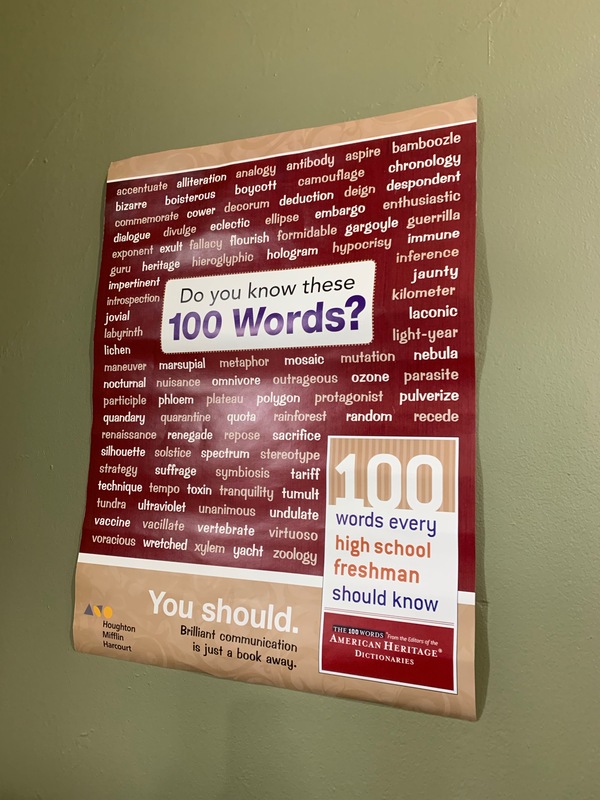 My eighth grader did not know all of them, so I have to plan to get him, me, and a dictionary together to learn some new words. Learning about new words is a great creative boost, so this was an unexpected bonus! Going to a new library and breaking myself out of my routine was helpful and keeps me from thinking things always have to be the way I’m used to seeing them. 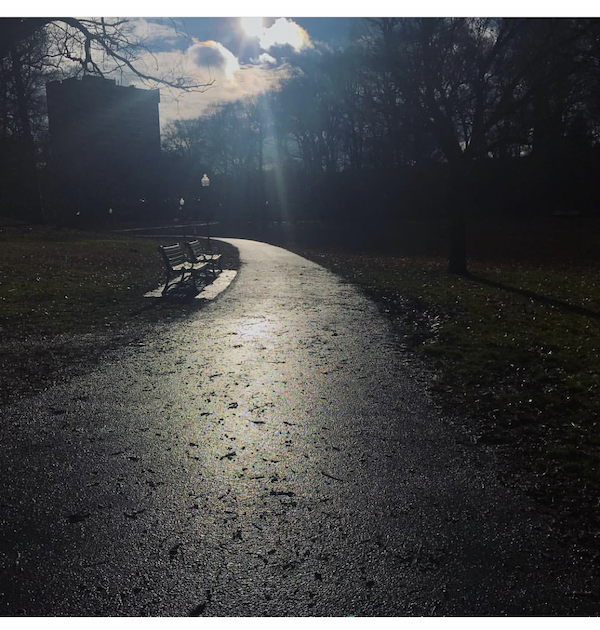 Meeting new people, trying new things, visiting new places is a great way to boost creativity. 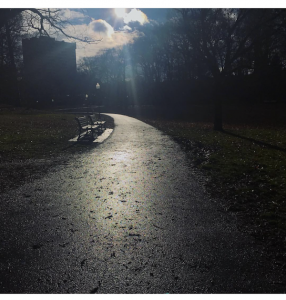 How do you get out of your routine? How do you stretch your creativity and imagination? 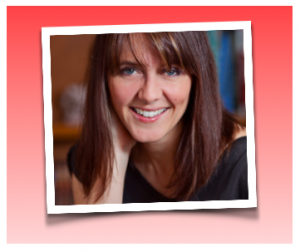 Exciting SCBWI Announcement for 2019! I’m so excited to announce that starting January 15, 2019, I am the SCBWI Regional Advisor of Pennsylvania: West! It’s a true honor and I’m really eager to build a new leadership team and to work to support the creative members of our region. We have some great events planned for 2019 already and we’re in the process of planning more. What are your favorite events to attend as a writer or illustrator? One of my big goals is to reach out to new communities and neighborhoods. I’m hoping we engage new writers and illustrators and learn from the incredible people in Western Pennsylvania. I really believe that by increasing the diversity of our knowledge and experiences we can do our best work as individuals and an organization. I’m a huge supporter of We Need Diverse Books and hope to guide our region into embracing diversity fully. SCBWI is a wonderful organization for writers and illustrators. 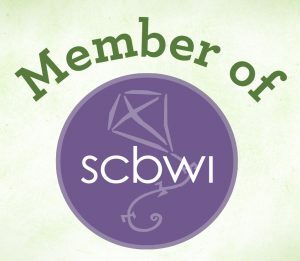 SCBWI is great for new members. There is so much to learn about the publishing industry. 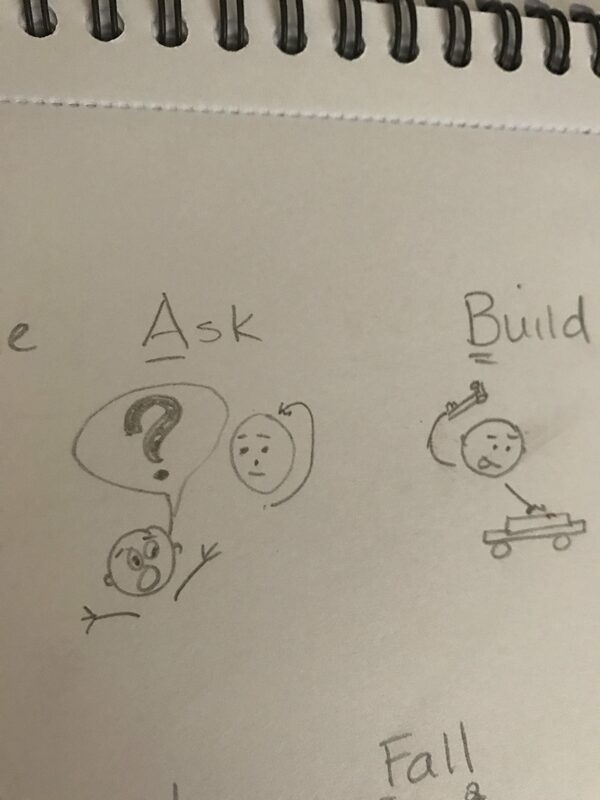 Many new creatives don’t even know what questions to ask. That’s where SCBWI mentors and critique groups and workshops and conferences help. Even the online forums are helpful for figuring out how to write a query…or understanding what a query is! But SCBWI is also useful for published writers. PAL members, or “Published And Listed” members, still need SCBWI. Connecting with other writers and illustrators helps me stay on top of changes in the industry and learn about new technology that can impact how and what we create. It’s no longer just about writing a good story, it’s about writing a great story that fits the publisher’s need at that exact moment, and one that fits with the market. There are so many options and we need help exploring them. We can now create graphic novels, ebooks, info-tainment non-fiction, and more, that being a part of SCBWI helps published writers and illustrators stay informed even as we hone our craft. Both new and experienced writers benefit from SCBWI critique groups. Critique groups are an essential part of my writing routine. I have found an incredible support network from my critique groups. I’ve learned so much from my group. And my writing has improved. I’m not sure which benefit is more valuable. If you’ve ever wanted to create for children, I invite you to join your local SCBWI chapter. Meet professionals and newbies, meet writers and illustrators, immerse yourself in the field and learn all you can. I promise you’ll meet amazing people. You will be inspired, and I know you will find some truly wonderful books that are great for any age! When I was in seventh grade, I got permission from my teacher to produce a literary magazine at my school. 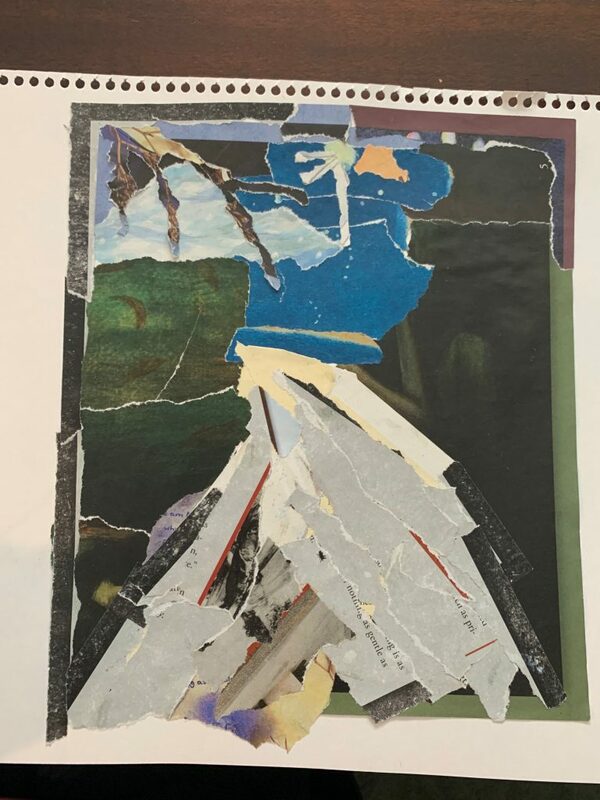 Me and several other kids typed up stories and poems and then I ran off copies on a mimeograph machine, the kind with the purple ink that people loved to smell. This year, I’m revisiting my childhood and starting a kids writing club at our elementary school. Thankfully I have a partner, our school librarian. She’s awesome and loves supporting reading and writing activities. We’re going to meet once a week and write, revise, and share stories. At the end of the club, we’ll have a book of stories. 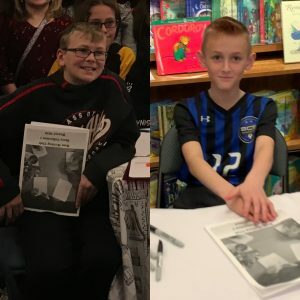 The kids don’t know it yet, but a local bookstore has even offered to host a book signing for them. I’m pretty excited and I hope the kids who sign up are excited, too. But before the club starts, I’m looking for suggestions on things that would be great to do in the club and things that would be awful. So, did you belong to a kids writing club or creative writing club when you were a kid? Do you wish you did? What would advice would you give me?